The State Department and White House coordinated to shield Sec. of State John Kerry from being asked last March about Hillary Clinton’s emails in an interview on CBS News’ “Face the Nation,” newly released emails show. “Think we can get this done so [Kerry] is not asked about email,” Jennifer Palmieri, then the White House’s communications director, wrote to then-State Department spokeswoman Jen Psaki on March 12, 2015, two days after Clinton held her first press conference to answer questions about her email practices. The emails were obtained by the Republican National Committee in a lawsuit and viewed by The Daily Caller. The Wall Street Journal and Washington Examiner also reported on the documents. Involved on one email chain discussing Kerry’s CBS appearance was Benjamin Rhodes, President Obama’s deputy national security advisor for strategic communications. Rhodes’ brother David is the president of CBS News. The emails are the first released to date which show how the White House and State Department interacted regarding the email scandal. They also lend support to what has long been speculated: that the Obama administration sought from the very beginning of the scandal to protect Hillary Clinton. Though Palmieri was at the White House at the time of the discussions, she had already announced that she would be taking a position on the Clinton campaign. Psaki took over Palmieri’s position when the latter left. “Agree completely and working to crush on my end,” Psaki wrote back. 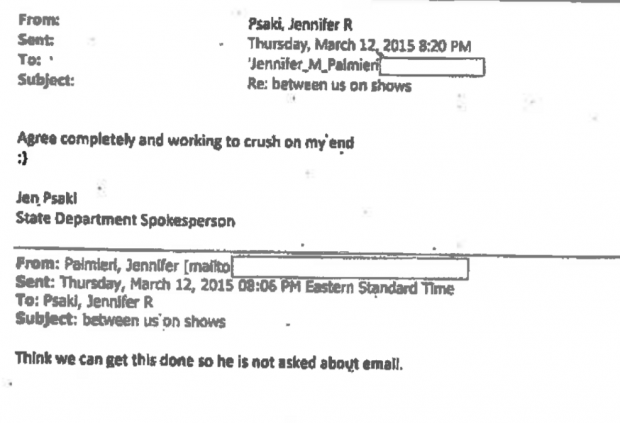 It is unclear from the emails what steps Palmieri took to quash the email angle. A spokeswoman for CBS News told The Wall Street Journal that no agreement was made with the State Department or White House to withhold questions about Clinton’s emails. “No subject was off-limits when this interview was arranged, as is the CBS News standard,” Caitlin Conant told The Journal. CBS News has been accused in the past of covering for the Obama administration because of the link between the Rhodes brothers. 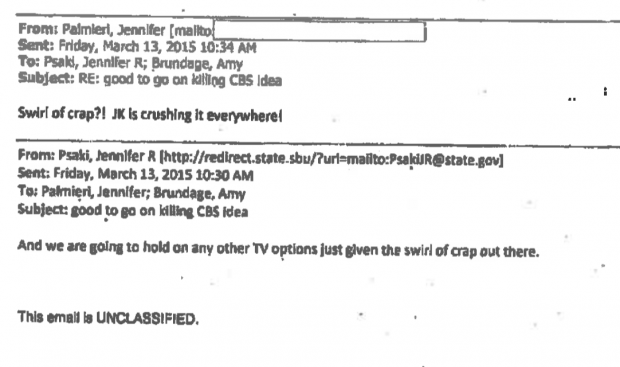 In 2014, CBS was accused of failing to cover a Ben Rhodes email of Benghazi talking points because of his brother’s position at the top of the network.